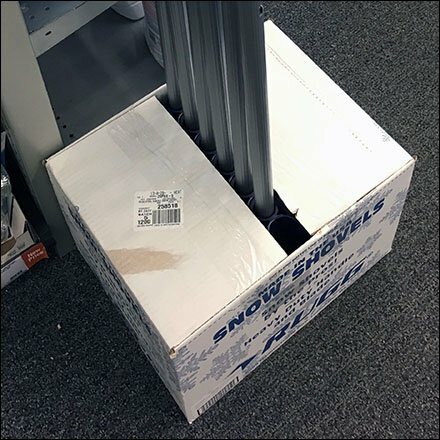 A perfect example of an un-deployed point-of-purchase display shipper shows How Not To Sell Snow Shovels. Still enclosed in the self-shipper and taped together one might hope for the sale of the full half dozen to a municipal street maintenance crew. But all humor aside this is quite an efficient point-of-purchase self shipper for shovels. Is your shipping as creative? Are your retailers failing you on set up? For more on that aspect of retail download “POP Compliance Rates & Best Practices.” This How Not To Sell Snow Shovels seen at Staples.